Given the popularity of our Stainless Steel Water Bottle: Smackdown and our recent commitment to covering green home issues, I wanted to write about a surprising and scary issue in the home: nonstick pans – so this post is about the best stainless steel cookware. I used to be an avid lover of nonstick pans. I adore eggs and nonstick coated cookware made my kitchen pans incredibly easy to clean. But, nonstick coatings are unbelievably bad for you and the environment. So bad that the fumes can kill birds. Check out this article and the references in it if you want to learn the specifics. For instance, according to the article, “although an accurate national accounting of deaths is not available, in a single year [a]Chicago veterinarian documented 296 bird deaths in 105 cases involving non-stick cookware. The problem with nonstick pans is something called polytetrafluoroethylene or PTFE. The most well known brand is Teflon®. Now, I’m not one to be an alarmist, but I take my personal health very seriously. At first, when Kimberly tried to convince me to throw out our nonstick Teflon pans I insisted that they were fine. But I did a lot of research and eventually realized that nonstick is terrible. The fact that the fumes can kill birds makes me think that nonstick may be even worse for you than BPA (the bad stuff in plastics and the reason to use stainless steel water bottles). So, when we decided to purchase a new cookware set we researched different types of cookware. Most professional chefs use copper or stainless steel cookware sets. If they use these materials, why not us too? But, our first stainless steel cookware set quickly broke. The handles came loose and food didn’t cook easily. The worst part about them was that the pans heated unevenly and were difficult to clean. Luckily, for a wedding present we received an extremely nice stainless steel cookware set – All-Clad. They pans have held up exceptionally well. To conduct our Stainless Steel Cookware comparison we have several different contenders. Contenders: Basic Stainless Steel Cookware Set, Cuisinart Stainless Steel Cookware Set, KitchenAid Stainless Steel Cookware Set, Celphalon stainless steel cookware set, All-Clad Stainless Steel Cookware Set. You are probably asking yourself – isn’t all cookware created the same? What’s the difference between these different brands of pans? How sturdy are the pans? Do they hold up well? You want to buy pans that last. And what type of metal are they? Generally you want 3 layers as this creates a more even distribution of heat which means the food cooks evenly. What type of lid is it – glass or stainless steel? I prefer stainless steel as it’s unlikely to break if I accidentally drop it. Is the pan made in the US or in China (or elsewhere)? Many people have concerns about metal contaminants of non- American made products. If you have an induction stove (you’ll know if you do) you need a pan that will allow for induction. The reality is that the more you pay the better pan you will get. 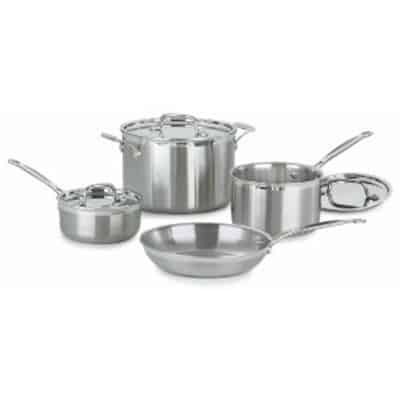 The Excelsteel 7 piece Stainless Steel Cookware set with glass lids is a good intro kit. It’s would be great for a college student or someone just starting out. It doesn’t have some of the features that the more expensive pans have, but if you’re looking for a good cheap stainless steel cookware set – this is it. A middle of the road stainless steel cookware set that is good, but not excellent is the Kitchenaid 10-piece set. However, these are not entirely stainless as they have silicone grips. The 10 piece Cuisinart Classic Stainless Steel Cookware set. 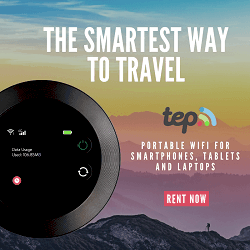 It has 350 plus reviews and given that you get more pots and pans than Kitchenaid for the price, this is probably the best of the middle of the line. It comes with stainless steel pan covers plus: 8- and 10-inch skillets; 1-1/2- and 3-quart covered saucepans, 3-1/2-quart sauté pan; and 8-quart covered stockpot. The following sets are the really high end stainless steel pans. All of the following sets are tri-layered which means they will be sturdier and last longer. I am providing more information about them because while they are more expensive, they will last longer. Because they’ll last longer they are more sustainable and better for the environment. We were lucky enough to get our All-Clad Stainless Steel Cookware for a wedding present. We’ve had the set for two years and it works amazingly well. We have had no problems with the pans. Save some discoloration that is common to all stainless steel. While the most expensive of stainless steel cookware, All-Clad really does last a lifetime and in doing so reduces waste. My aunt and uncle have had their same All-Clad set since they got married 30 years ago. We also got an additional 8″ fry pan (great for eggs) and 12″ fry pan (perfect for larger meals). All-Clad is made in the USA — mostly. It seems that their lids as well as some appliances are made in China (and subject to thorough inspections and testing). Their pots and pans are made from US supplied metal manufactures and bonded together at the Pennsylvania manufacturing facility. The Cuisinart MultiClad Pro 7 piece set. But given that there is only 1 fry pan in the set you’ll likely want to buy a separate skillet. Overall the Cuisinart gets better reviews than the Calphalon; but people who also owned All-Clad were mixed on whether or not they would buy the Cuisinart again. Many said they noticed no difference. A few people mentioned the pans felt lighter. And they are made in China. So if the price is more important to you and you are ok with a Chinese manufactured pan you will want to buy the Cuisinart MultiClad Pro. Reviewers of the Calphalon seem to love it. There are some complaints about customer service, the handles getting hot, and the fact that this cookware is made in China. But overall people really like it. A difference between this and All-Clad (other than the cost). Is that All-Clad tops are Stainless steel and Calphalon are glass. Cleaning stainless steel pots and pans is a little more difficult than cleaning nonstick pans. But, in two years since we’ve owned our All-Clad we haven’t had too many problems. While not a green product, it is free of phosphates and does wonders for cleaning stubborn stainless steel stains. We use it maybe once a month on our most frequently used pans to keep them sparkling. Well, stainless steel does get discolored and stained. But it doesn’t affect the use of the pans at all. I’ll be honest — ensuring that food doesn’t stick to stainless steel plans is an art. But, here’s the trick — make sure that the pan is hot x 2. First, get the pan hot. Second, get the oil/butter hot. This doesn’t mean to turn the heat on high (for boiling water — sure, but not for sauces, eggs, etc). Turn the heat on medium to medium low and let the pan get hot throughout. Then add a little oil. Let the oil heat until it’s almost smoking. If you tilt the pan the oil will spread and run like water. Only once the pan is hot should you add the food you are cooking to it. What about “Green” nonstick cookware? You can buy nonstick cookware that is supposedly fine for you and doesn’t contain the same chemicals as the bird-killing nonstick pans do. But honestly, I don’t fully trust these products. I will stick to stainless steel because I know it’s safe. I would buy the All-Clad cookware again in a heartbeat. For made in America cookware that has a long track record and proven reputation you just can’t beat it. However, given the high price of it, my second choice would be Cusinart multiclad. What features do you look for in cookware? Do you currently use nonstick pans? My steel set is currently older then I am! I inherited it from my mother, but while it’s useful it’s old, some of the handles are falling off or missing altogether. 🙁 I’d love to update – steel is definitely the way to go! I love the idea of stainless steel cookware and am looking forward to investing in a really good set of my own soon! @ Courtney @ Brooke – I also love Cast Iron! Thanks for this post! I’ve long been wary of non-stick, but this really helps to set my facts straight. Bad stuff! I’ve been using stainless steel pots for camping for a long time, and now I need to replace my home cooking stuff too. I’m currently using non-stick and cast iron. Looking to add stainless steel to my collection. I’ve burnt more than my share of non-stick pans. Time to switch over to stainless steel. I currently use nonstick skillets, even though I know I probably shouldn’t. I don’t need a whole new “set” though, because the pots and pans I have are fine. I just need to buy one new, large, not-nonstick skillet. I hear they are better than nonstick for making good sauces, too. i LOVE stainless cookwear. great article! I recently purchased the mid-priced set of Cuisinart stainless cookware. I had been looking for one made in America, but the price on the All-Clad was out of my range at this time. I absolutely love this set. The weight is perfect and it does a wonderful job of cooking quickly. The added bonus is that there is not a smidgen of Teflon anywhere. My home kitchen just added a Michelin star! I received my stainless steel cookware from my kids for Christmas. (Emeril) They have a copper strip and look wonderful on my potrack. And I took my cast iron pans out from the back of the cupboard – now I am really cooking (pun intended.) I am thinking of donating my non-stick pans to charity – it that a good idea??? Let me know if you can. @Jane – I think you’d be fine to donate your Stainless steel cookware to charity. But make sure they are in good shape and not peeling at all. (If nonstick/teflon pans are peeling it’s really bad as pieces get stuck in your food). I prefer to use cast iron for most of my cooking. I have used stainless steel in the past, and I did not like it as much as I like my cast iron! I have had some pans for decades, and they are a wonder. I do not like non-stick pans. Great article, regarding the safety of stainless steel sets, I would add that being steel, sets are “naturally” extremely durable and longer-lasting. The metal is both really solid and non porous. Since it doesn’t react to food and it’s heat resistant, it’s the safest of cookware with which to cook. I agree that cast iron is great for cooking. It’s easy to clean and especially helpful for cooking meat. But overall we tend to use stainless steel cookware more than cast iron. Blanket statements such as “nonstick coatings are unbelievably bad for you and the environment” are misleading. I prefer to cook on stainless steel myself, and use Regal Ware’s Marcus collection, because it is 100% American made (unlike the All-Clad lids) and I prefer the handles… That being said, I LOVE some pans to be nonstick (only my omelet pans, actually). 1st thing to know is there are many PTFE-free nonstick coatings available. So, that’s to note for the environment. As far as health, PTFE is not harmful to humans. PTFO is harmful. PTFO is an agent used in the production and application of PTFE products, and its release in fumes is what is killing the birds. And, through an easy process all of the PTFO can be eliminated… The question you need to ask: is the manufacturer doing this process properly? That question makes me always want to choose non-3rd world manufacturers of quality cookware. I like Swiss Diamond’s products personally, they’re not cheap, but I trust them. I have never tried a PTFE free cookware, so I’m not sure how well they work or last, but if you are still uncomfortable with PTFE, you should really check them out. No need to ruin your eggs! After much research into the most chemical free cooking, the winner seems to be stainless steel products such as all clad and cast iron. I cook exclusively using these two types of cookware and have never regretted it. They clean up very easily and maintain even temperatures. My husband and I purchased Cuisinart Stainless Steel Cookware after our wedding with some of our gift money. We considered Calphalon, Anolon, AllClad and Circulon as options, but we saw this one at a local kitchen supply store and bought it there. They were offering it for a good deal but we came home and found this even lower price at Amazon so we returned the set at the store and bought it online. We’re glad we did! The value is outstanding. This cookware cooks quickly and evenly, the handles stay nice and cool and it is a breeze to clean up. Just put the pan in the sink with some water, let it soak for a few minutes and it wipes clean right away. It’s even easier to clean than my old nonstick! We also bought the 5 1/2 quart saute pan, a two-piece nonstick skillet set (still comes in handy for scrambling eggs and cooking ultra low-fat meals) and the four-piece utensil set came free with the 10-piece set…Cuisinart makes excellent products…you’d be silly not to treat yourself to quality cookwear. I love stainless steel cookware. It’s safe and durable. Not too pricy -it comes in vary price ranges. I don’t need to worry about toxin when cooking some kinds of foods. but I own a couple of nonstick pan, 8″ and 12″ for breezy cooking. I have never had any issues with my stainless steel cookware. I love cooking with stainless steel cookware. It’s durable and versatile. Can be used on any cooktop and in the oven. Easy to clean. Doesn’t have chemical reaction with acidic food. Has good heat conduction. Having a high quality set is worth the investment. I agree, stainless steel cookware is great. I banished non-stick pans from my kitchen years ago. blog. 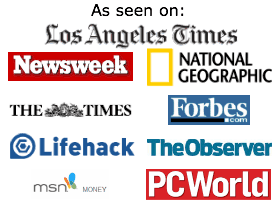 I saved as a favorite it to my bookmark website list and will be checking back in the near future.